We have noticed that some newly arrived visitors do not know, for sure, how to interact with traffic when they are crossing a street. We would like to avoid any accidents between people and cars. Below we are providing a brief description of Rules of the Road and Rules for People Walking. For immediate access to this information in your home language, we suggest you take the text and use Google translate (we can only hope that the automated-translator will provide a proper meaning). The rules about driving and walking across the street are different in different countries. 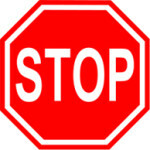 In Bloomington, there are many 4-way stop intersections and also many 2-way stops. When a car comes to an intersection that has a stop sign, the car must stop and allow cars and pedestrians (walkers) to cross in front of the car. If you are walking, you should not assume the driver will see you. You should look left and right, to make sure it is safe to cross. When a car comes to an intersection that has a yield sign, the car must slow down and be prepared to stop if there is traffic or a pedestrian approaching on the cross street. However, walkers should not assume the driver will yield to a pedestrian. Crosswalks are painted on streets to show where pedestrians should cross the street. Sometimes there is a crosswalk other than at an intersection. Cars are supposed to stop for a pedestrian if he or she is walking in a crosswalk. However, BE CAREFUL; drivers do not always follow the rules about crosswalks. Always look left and right before walking across a street and pay attention to “pedestrian signals” (see below). Pedestrian Signals that You Should Know In the city of Bloomington, many intersections will have traffic lights with electronic pedestrian signals that tell the pedestrians when they are allowed to cross the street. 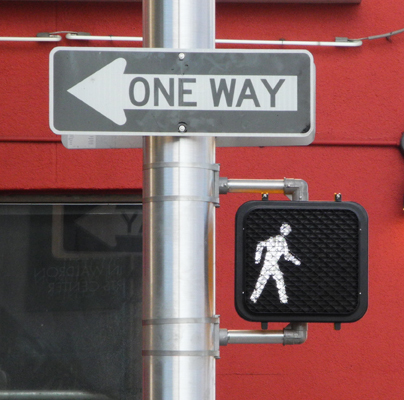 These signals may also make sounds that tell a blind pedestrian when to cross. 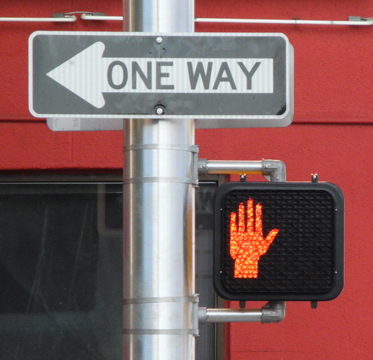 The red hand means that, if you are at an intersection, you may not cross the street at this time. You must wait until the walk signal (below) is displayed. 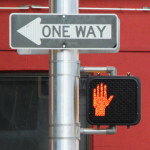 If the white walking man changes to a flashing red hand, it tells you that you should not begin to cross and if you are already crossing the street, you should hurry across. 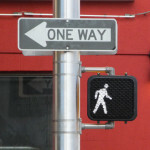 At some intersections, there is a button on the pole below the pedestrian signal. You can press this button to cause the traffic light to change and allow you to cross. We hope you will walk with care and pay attention to what is going on around you.